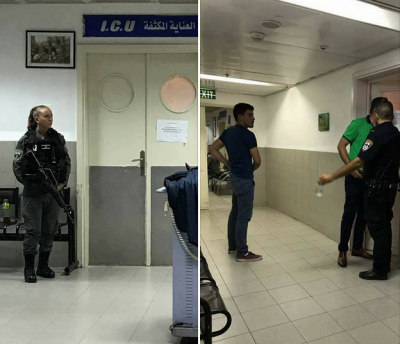 Dozens of Israeli soldiers invaded, on Tuesday morning, the Al-Makassed Hospital, in occupied Jerusalem, and surrounded the Intensive Care Unit, to abduct a seriously wounded Palestinian teenage boy. The soldiers invaded the hospital, and stationed themselves in front of the Intensive Care Unit, to abduct ‘Ala Abu Tayeh, 17, who suffered a life-threatening injury, after the soldiers shot him last night, in Silwan town, south of the Al-Aqsa Mosque, in Jerusalem. Medical sources at Al-Makassed Hospital said dozens of soldiers are deployed around the medical center, in addition to many soldiers who invaded it, and broke into various patient’s rooms, before surrounding the ICU where the seriously wounded teen is receiving treatment for his serious injuries. The hospital administration strongly condemned the Israeli military invasion into the hospital, including its Intensive Care Unit, especially since this invasion is part of various previous invasions. It called on international human rights groups to immediately intervene, especially since dozens of soldiers are still surrounding the hospital, in addition to several soldiers who are stationed in front of the ICU, in addition to harassing and inspecting the ID cards of patients, physicians, nurses, workers and visitors. Also in Jerusalem, the soldiers abducted six young Palestinian men in several areas of the city, and took them to a number of interrogation centers. Furthermore, many Palestinians suffered the severe effects of teargas inhalation, on Wednesday morning, after Israeli soldiers invaded Beit Ummar town, north of Hebron, in the southern part of the occupied West Bank. On Tuesday at dawn, the soldiers abducted seven Palestinians, including a journalist, from the West Bank governorates of Jenin, Tulkarem, Nablus and Tubas. In addition, the soldiers fired dozens of live rounds at homes and farmlands, east of Khan Younis, in the southern part of the besieged Gaza Strip.